If the memory of my twenties is intact, I believe Joni Mitchell once wrote these wise words: “Everything comes and goes…pleasure is gone too early; trouble leaves to slow”. Knowing Joni’s oeuvre, I am guessing that she wasn’t singing about products that you make a life with that suddenly disappear, without the merest hint of a warning. But since I am fortunate enough to have worked out most of my Love and Feelings issues, I can happily use Joni’s words as a jumping off point to discuss this strangely pressing problem. My first great lost (product) love occurred about six years ago. It was a mascara by Dior that had cashmere in it. And the concoction actually made me appear to have eye lashes. I was faithful through the end of the Clinton Administration, and well into the W years. Then the unthinkable happened: While feverishly looking for my magnificent mascara at the SoHo Sephora (one of the circles of hell, but that is for another post), I was coldly informed that it was discontinued. The last time I was in Paris, I fell deeply in love with the soap stocked in the hotel where Mr. H and I were staying for my birthday. (This definitely makes my life sound more glamourous than it is, trust me.) I knew the brand and when I got back home, I immediately ran off to Bergdorf’s to get a few bars. Once Mr. H appeared to be happy with said soap, I began taking on slightly larger positions out of convenience. It was then unanimously determined by me that this would be our “house soap”. Life was good. About two years ago, my soap suppliers (yes, that last word is plural) began tossing out phrases like “delayed on account of repackaging”, “limited supplies” and “not knowing when they would have more”. Life was becoming a little less good. Through sheer tenacity, I was able to get about a case of my beloved bars. At a consumption rate of about one bar every two weeks, I felt confident that I could ride out the storm. bar of everything that didn’t repulse me. I will spare you the details of my research, which was conducted over a period of months. 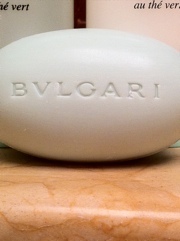 But the findings were not promising: I had found the world’s most perfect soap back in Paris. There could be no other. I scored a few more boxes over the last several months, but as of this writing, I have but five bars and my suppliers are telling me they don’t know when to expect more. One did say he’d call me, though. A few days ago I began to take notice of the lovely soap they stock here at my Nothing is a Problem Hideaway. It smells delicious, lathers well, and Mr. H seems to like it. So, through the magic of Poolside Internet, five bars should be waiting for me when I get home, and several of my precious Parisian bars are “delayed”, but should arrive sometime in the not-so-distant — or totally distant — future. We shall see. You are currently reading Soaplessley Devoted at Some Cozy Night.